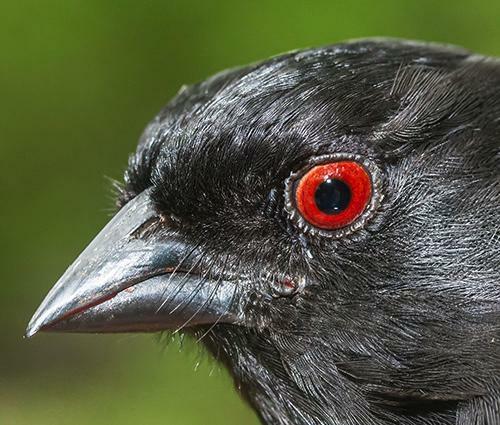 Each spring, millions--more likely billions--of birds depart the New World tropics to begin a perilous northbound migration to their breeding grounds in North America. Most fly by night, probably plotting their paths via an inherited map synchronized with the stars. Some may have an internal compass that follows Earth's gravitational fields, while other species use clues such as infrasonic sound or visible landmarks. 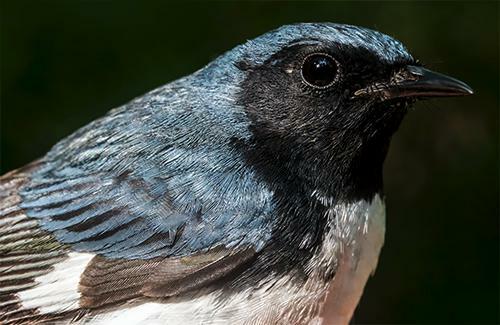 That they make it at all is one of the great wonders of nature, and we are enthralled come May at Hilton Pond Center to capture and place bands on these migrants as they continue northward. As a Carolina Piedmont locale, the Center lies halfway between two flyways--Atlantic Coastal and Appalachian--one likely reason we don't see really big numbers that occur along those routes. Even so, the diversity of bird species we handle is always interesting, and this year in May we had 122 individuals of 28 species. Most were migrants--some of which will stay the summer--but several were year-round Hilton Pond residents that put on new plumage for the breeding season ahead. 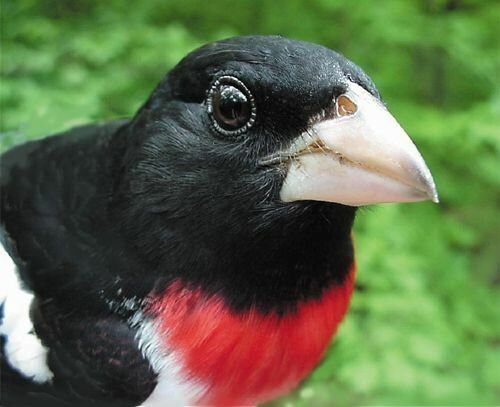 To celebrate the "Birds of May 2017," our installment below is mostly avian images with brief comments about local abundance and breeding status reflecting our 36 years of on-site banding research. STATUS AT HILTON POND: Migrant & summer resident; likely breeds on-site, with one nest found on adjoining property. LOCAL ABUNDANCE: Common spring through summer and abundant in August-September; 5,696 captured since 1984, our fourth-most-commonly banded species. NOTES: About 11% of our banded RTHU have returned in at least one later year; one female showed up eight years in a row. STATUS AT HILTON POND: Migrant; no confirmed breeding records from South Carolina. LOCAL ABUNDANCE: Uncommon but regular in spring & fall. migration, especially at our black sunflower seed feeders in spring; 54 banded for both sexes since 1982. 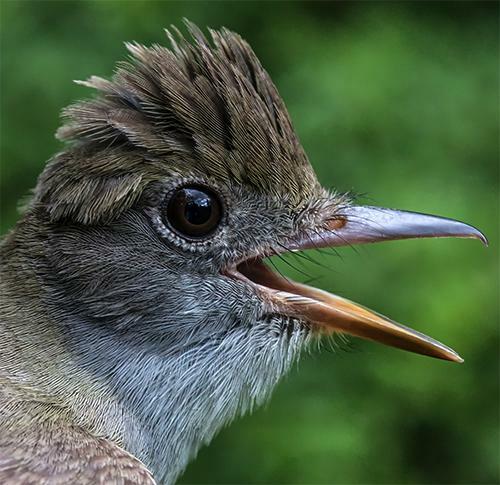 NOTES: This species' sharp, metallic chink call is usually our first clue RBGR have arrived in spring from their Neotropical wintering grounds. 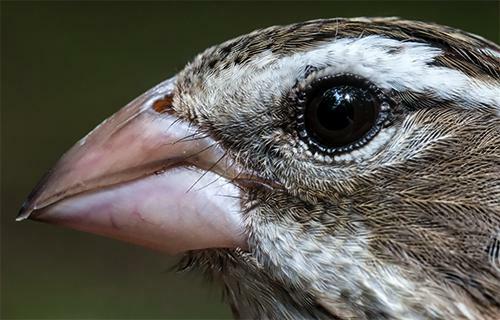 NOTES: Female and immature male RBGR both resemble a giant brown sparrow but with prominent white superciliary line (see photo above); under-wing coverts (photo below) are yellow in female, rosy in immature males; young males may have pale, rosy breasts. STATUS AT HILTON POND: Migrant, with some staying to breed and others undoubtedly going further north; a few may spend the winter in the area; breeds on-site with nests found. LOCAL ABUNDANCE: Very common & regular, especially in spring (62% of bandings); 940 banded since 1982. 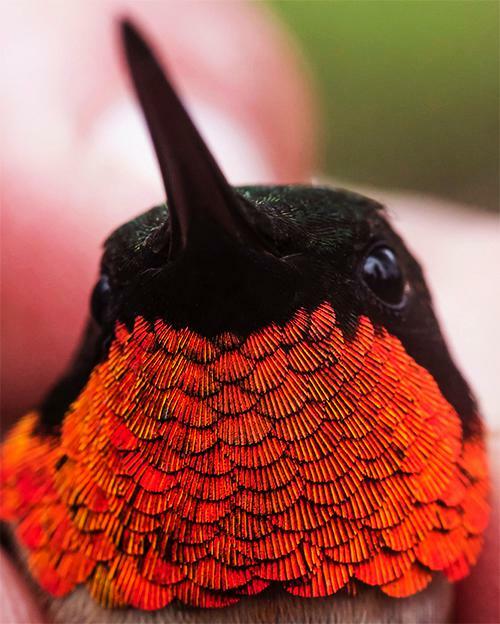 NOTES: During our mid-winter Operation RubyThroat hummingbird expeditions to Crooked Tree in Belize, GRCA were among the most commonly banded Neotropical migrants. STATUS AT HILTON POND: Migrant & summer resident; breeds on-site with one nest found. LOCAL ABUNDANCE: Uncommon but regular; 53 banded since 1982. STATUS AT HILTON POND: Migrant & summer resident; breeds on-site with several nests found. LOCAL ABUNDANCE: Relatively common & regular; 136 banded since 1982. 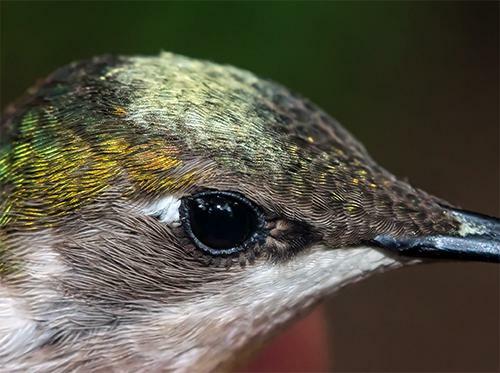 NOTES: One of our first spring migrants to arrive; pairs collaborate on nest building, incubation, and nestling care; nest adorned with lichens resembles a tall Ruby-throated Hummingbird nest. STATUS AT HILTON POND: Migrant & summer resident; likely breeds on-site; females with fresh brood patches have been captured but no nests found. LOCAL ABUNDANCE: Common & regular; 324 banded since 1982. 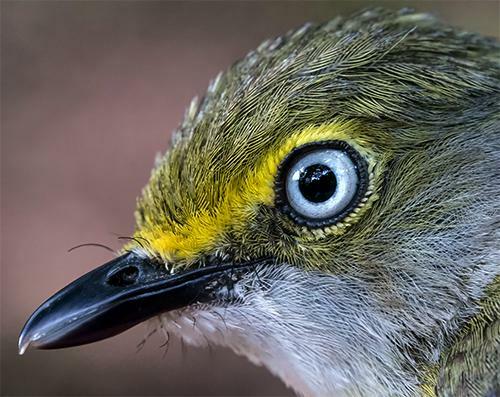 NOTES: Although vireos are yellow and warbler-sized, they are in an entirely different family (Vireonidae). Note the hooked bill in the photo above, characteristic of vireos; compare that to the straight bill of the several warblers just below. STATUS AT HILTON POND: Migrant & questionable summer resident, although the species breeds across South Carolina; most captures--the vast majority being males--have been in May as probable migrants; no nests found and no females captured with fresh brood patches; this is an enigmatic species at Hilton Pond. LOCAL ABUNDANCE: Uncommon and regular, although far more common when the Center was in the shrub stage of vegetational succession; 366 banded since 1982 (70% in spring). NOTES: The Warbler Family (Parulidae) includes COYE and 37 other "eastern" species, 35 of which have been seen at Hilton Pond Center since 1982. All but a few are migrants that pass through, heading for breeding grounds in Canada, New England, the Great Lakes States, or the higher elevations of the Blue Ridge and Appalachian Mountains; our "missing" warblers are Cerulean, Mourning, and the endangered Kirtland's--all of which take migration routes to our west. STATUS AT HILTON POND: Migrant, mostly in spring (see below). LOCAL ABUNDANCE: Uncommon but regular; 127 banded since 1982. 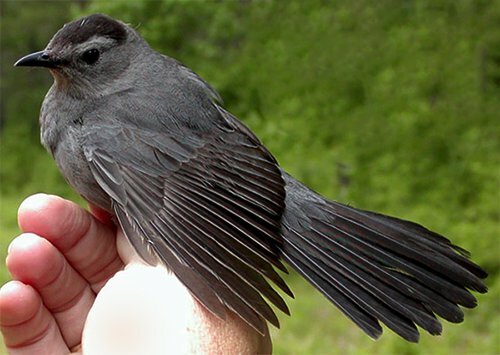 NOTES: We're not surprised only 7% of our blackpolls have been banded in fall because this species follows a circular migration pattern; in spring it flies overland across eastern North America going north; in autumn a very different southbound route takes it out over the Atlantic Ocean en route to South America. STATUS AT HILTON POND: Migrant; no local breeding evidence, although there are a few state records less than 50 miles to our east. LOCAL ABUNDANCE: Very common & regular; 459 of both sexes captured since 1982--our second-most-commonly banded parulid (after Yellow-rumped Warbler with 2,239). NOTES: In spring we've watched AMRE flash their bright wing and tail patches; this may have a courtship function but also apparently startles insects into flight where redstarts can capture them. NOTES: First-year male AMRE are sometimes difficult to differentiate from females; usually, however, the males have flanks with more of a salmon tint, while females are yellow. STATUS AT HILTON POND: Migrant & summer resident; likely breeds on-site; no nests found, but females with fresh brood patches and recent fledglings have been captured in June. LOCAL ABUNDANCE: Very uncommon but regular; 68 banded since 1982. NOTES: One of our smallest warblers; moves rapidly through tree leaves in pursuit of insects and other invertebrates; winters primarily in Mexico and Caribbean. STATUS AT HILTON POND: Migrant; only a few breeding records from mountains in extreme northwestern South Carolina. LOCAL ABUNDANCE: Relatively common & regular; 189 banded since 1982. 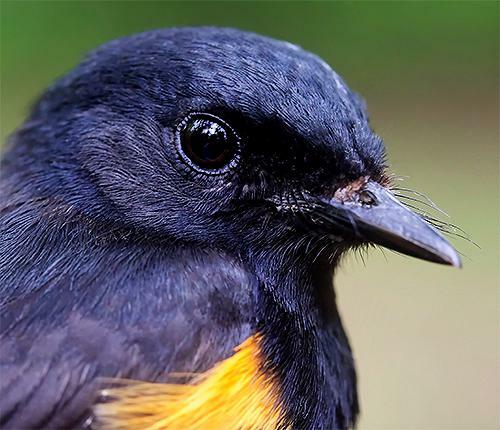 NOTES: Male and female BTBW are so different in appearance early ornithologists thought they were two separate species; overwinters in relatively small area of eastern Costa Rica, Panama, and the Caribbean. STATUS AT HILTON POND: Migrant & summer resident; likely breeds on-site; no nest found but females with fresh brood patches have been captured. LOCAL ABUNDANCE: Uncommon but regular; 178 banded since 1982. NOTES: This species' long claws allow it to cling to tree trunks and undersides of limbs as it probes bark crevices for insects, spiders, and other invertebrates. STATUS AT HILTON POND: Migrant & summer resident; likely breeds on-site; no nests found but females with fresh brood patches have been captured. LOCAL ABUNDANCE: Uncommon but regular; 190 banded since 1982. 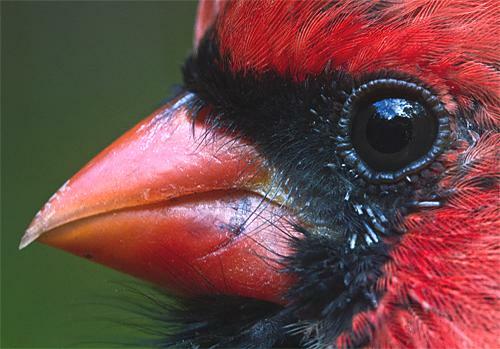 NOTES: Adult male is sometimes mistaken for male Northern Cardinal but lacks black mask and crest; SUTA catches bees and wasps on the wing, crushing them with its heavy yellow-brown bill. STATUS AT HILTON POND: Migrant, with 99% captured during spring; some may remain during winter in mixed blackbird flocks; likely breeds on-site, with gravid females and recent fledglings captured. 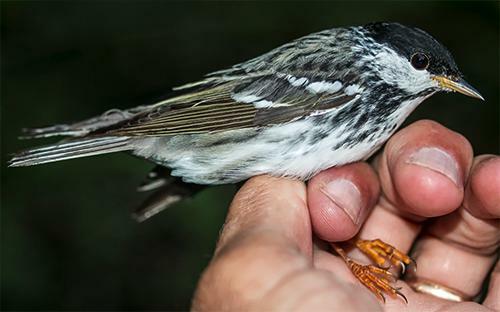 LOCAL ABUNDANCE: Common and regular; 442 of both sexes banded since 1982. NOTES: As brood parasites, BHCO undoubtedly take a toll on many breeding bird species at the Center. STATUS AT HILTON POND: Migrant, especially in fall. 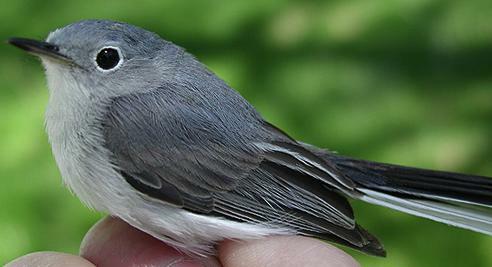 LOCAL ABUNDANCE: Very common & regular; 530 banded since 1982--90% in fall migration. 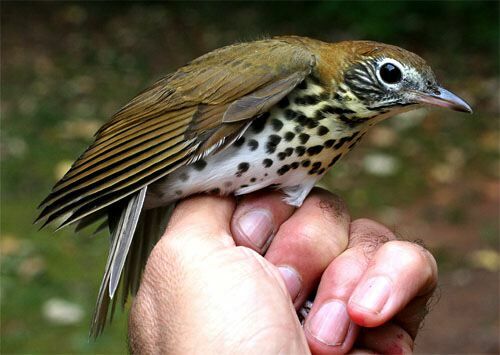 NOTES: The most common of our "spot-breasted thrushes"; usually captured in the lowest shelves of our mist nets as they fly low through the woods; this low-flying behavior also makes them one of the most commonly killed migratory birds due to first-floor window strikes on private homes. STATUS AT HILTON POND: Migrant & summer resident; likely breeds on site; no nests found but females with fresh brood patches and recent fledglings have been captured. LOCAL ABUNDANCE: Uncommon but formerly regular; in decline over past 10-15 years for unknown specific reasons; 193 banded since 1982. 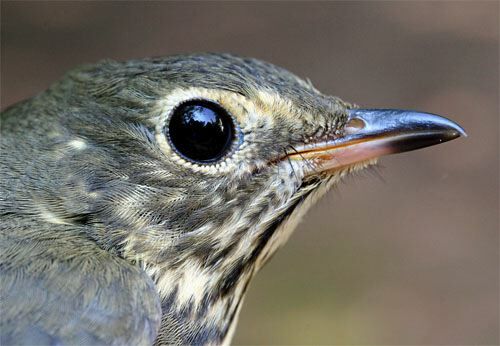 NOTES: Of the "spot-breasted thrushes," this is the only species that truly has round "spots" in the adult; the others have streaks; precipitous decline in numbers has been attributed to cowbird nest parasitization and loss of invertebrate prey due to acid rain. LOCAL ABUNDANCE: Relatively common & regular in spring migration, especially at our black sunflower seed feeders; 359 banded since 1982--76% in spring. 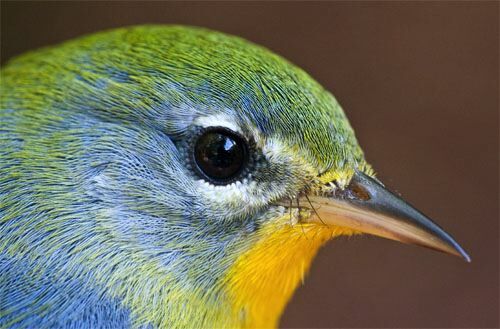 NOTES: The bi-colored bill of both male and female INBU in breeding condition is an excellent field mark. STATUS AT HILTON POND: Year-round resident; breeds on-site, with nest boxes (and old woodpecker holes) used on many occasions. LOCAL ABUNDANCE: Common & regular; 302 banded since 1982, including many chicks in our local nest boxes. NOTES: Recently fledged EABL often hang out with their parents through the first winter, joining with neighbors in flocks of 10-20; to our knowledge, none of our local bluebirds migrate, and we doubt we host any migrants from further north; established pairs maintain year-round pair bonds and can be seen inspecting nest boxes all winter. STATUS AT HILTON POND: Year-round resident; breeds on-site with many nests found. LOCAL ABUNDANCE: Abundant & regular; 2,644 banded since 1982--our sixth-most-commonly banded species. NOTES: NOCA have declined in local abundance since the 1990s, primarily because of successional loss of shrubs (where they foraged and found shelter) and densely vegetated Eastern Red Cedar trees (where they frequently nested); some decline may also be due to West Nile Virus. STATUS AT HILTON POND: Year-round resident; apparently breeds on-site; no nest found but females with fresh brood patches and recent fledglings have been captured. LOCAL ABUNDANCE: Formerly common & regular at the Center, now very uncommon, possibly because of West Nile Virus and loss of local shrub habitat through vegetational succession; 722 of both sexes banded since 1982. NOTES: As ground nesters, EATO chicks often fall prey to feral cats. 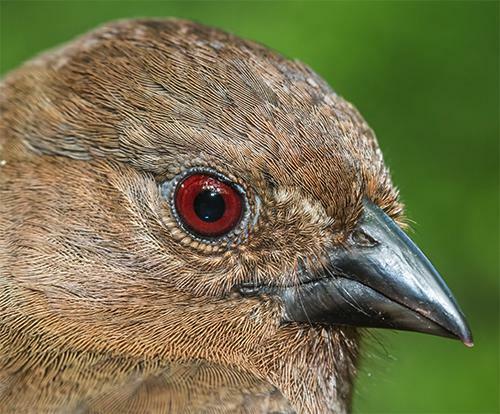 NOTES: Eastern Towhees, formerly Rufous-sided Towhees, were renamed when ornithologists learned they did not breed with western populations now known as Spotted Towhees; young EATO have brownish-gray eyes that usually turn red in adults (as in photo just above). STATUS AT HILTON POND: In early 1980s HOFI were migrants only, now most are year-round resident breeders with no known long-distant migrants in nearly 20 years; most bandings in past decade have been recent fledglings; breeds on-site with nests found. LOCAL ABUNDANCE: Very abundant & regular; 10,153 banded since 1982--our second-most-commonly banded species (edged out by American Goldfinches with 10,865). 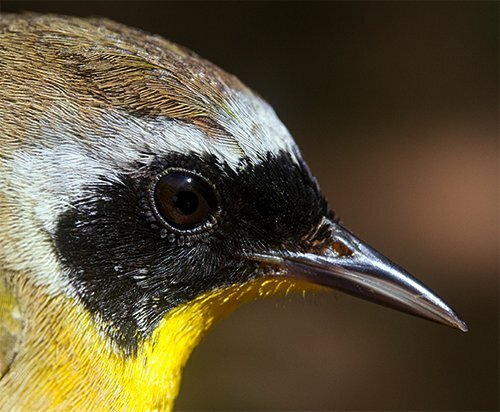 NOTES: This species from the western U.S. was introduced to Long Island NY in the early 1940s; eastern HOFI extended their range about 25 miles per year both south and west and now meet the species' western population in western Nebraska. STATUS AT HILTON POND: Year-round resident; breeds on-site with nests found. LOCAL ABUNDANCE: Common & regular; 221 banded since 1982. 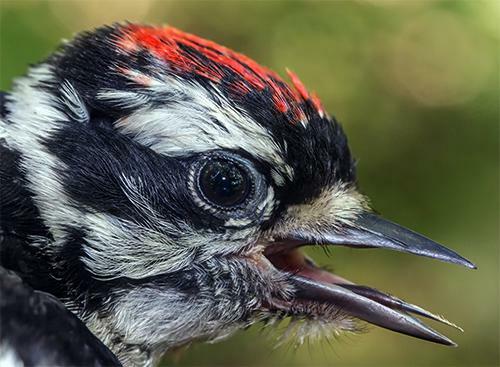 NOTES: We had at least four pairs of banded Downy Woodpeckers captured in Spring 2017 at Hilton Pond Center--a surprisingly large number for an 11-acre island of mostly undeveloped habitat with a limited number of mature hardwood trees suitable for woodpecker cavities. STATUS AT HILTON POND: Year-round resident; apparently breeds ons-site; recent fledglings and females with fresh brood patches have been captured. LOCAL ABUNDANCE: Relatively common & regular; 174 banded since 1982. NOTES: Any small yellowish bird coming to our sunflower seed feeders is typically either an American Goldfinch or a Pine Warbler; although PIWA are also insect- and berry-eaters, the recent fledgling in the photo above was captured in a seed-baited trap. NOTES: Adult male RTHU have returned to Hilton Pond as early as 27 March (four different years), with first adult females arriving a week or two later (early record is 8 April); not until mid- to late May do our nectar-rich Trumpet Creeper vines begin to bloom and deposit yellow-green pollen on the heads of hummers that visit (see photo above); in 2017 through 31 May we banded 23 new RTHU at the Center, already supplemented by a whopping 31 returns banded in previous years; ten of those were recaptured on 29 May, with nine more the day following. 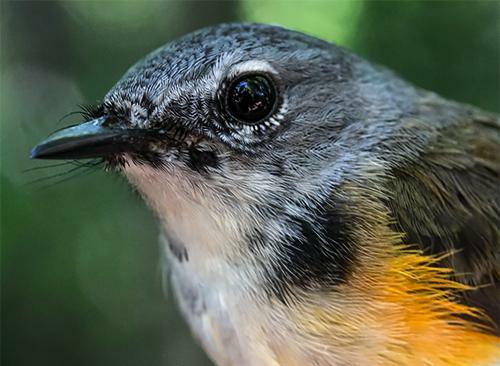 May is always a good month for banding birds at Hilton Pond Center, especially if one appreciates the diversity that comes with having a mix of resident birds AND Neotropical migrants. Those individuals depicted above represent a mere smidgen of countless birds arriving, staying, or passing through the Carolina Piedmont this spring. Our mist netting efforts were limited somewhat because of out-of-state travel and heavy rains on several days, else we likely would have caught even more to decorate this page. If the weather is good in September it will be interesting to compare our fall banding results with what we've just accomplished in May 2017.
plus lists of all birds banded or recaptured during the period. If you like shopping on-line please become a member of iGive, through which 1,800+ on-line stores from Amazon to Lands' End and even iTunes donate a percentage of your purchase price to support Hilton Pond Center. Every new member who registers with iGive and makes a purchase through them earns an ADDITIONAL $5 for the Center. You can even do Web searches through iGive and earn a penny per search--sometimes TWO--for the cause! Please enroll by going to the iGive Web site. It's a painless, important way for YOU to support our on-going work in conservation, education, and research. Add the iGive Toolbar to your browser and register Operation RubyThroat as your preferred charity to make it even easier to help Hilton Pond Center when you shop. 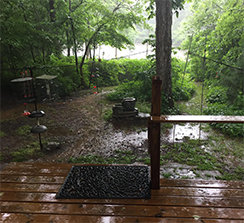 --Although we were gone to West Virginia for the first week of May 2017 (see write-up above), our return to Hilton Pond Center allowed for a a nice assortment of birds in nets and traps. 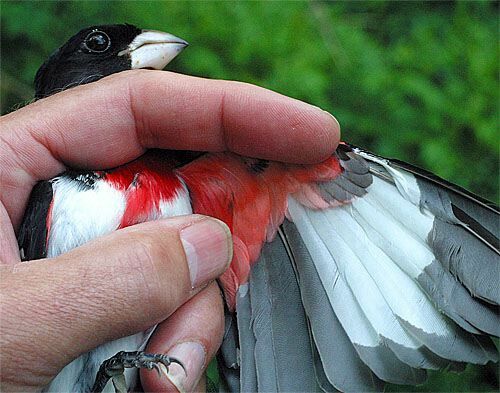 We banded 28 different species, some of which were just passing through on their way north. --We had two remarkable return days for Ruby-throated Hummingbirds on 29-30 May 2017, with 19 birds recaptured (see list at lower left for all May returns). It's always good to see those RTHU from 2014, three of which have been recaptured locally each year since they were banded. 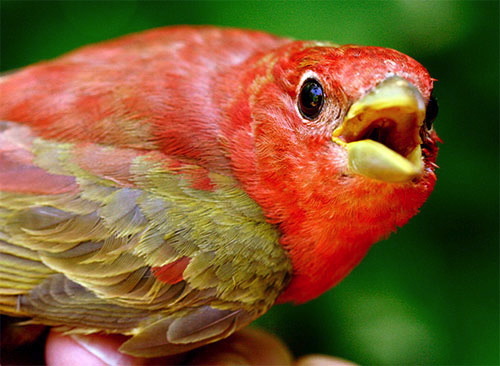 Those older RTHU were beat out, however, by two male birds at least six years old--American Goldfinch and Northern Cardinal. --As of 31 May Hilton Pond Center's 2017 Yard List stood at 67--about 39% of the 171 avian species encountered locally since 1982. 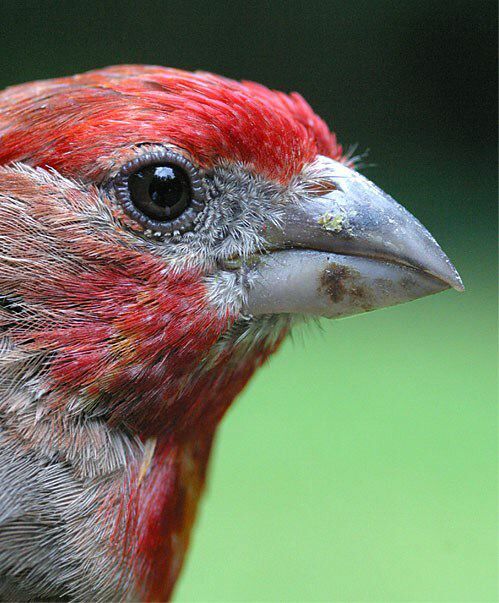 (If you're not keeping a yard list for your own property we encourage you to do so, and to report sightings via eBird.) 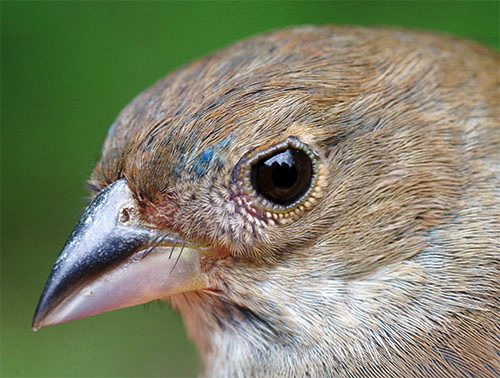 New species during the second half of May: Blue Grosbeak. 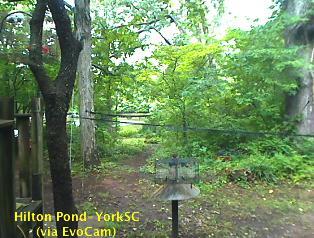 In all we got 8.89" in the month of May; direct rainfall and run-off brought the pond's level up three-and-a-half feet! We feel much better starting the summer only 8" from full pond--knowing there will be lots of evaporative heat when July and August roll around. --After being absent at least six weeks, two pairs of Wood Ducks showed up on Hilton Pond the morning of 25 May. One hen investigated a nest box and began swimming with her tail held very high, a behavior we have not witnessed before but suspect is solicitation for mating. 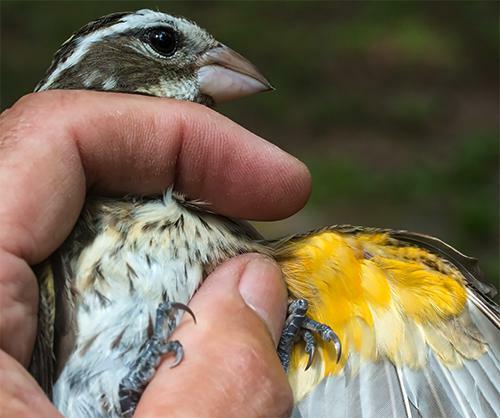 Our woodies typically pair up very early in the year and start laying by late February, so this is the first time to our knowledge they could be double-brooding locally. 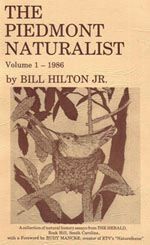 --The immediate past installment of "This Week at Hilton Pond" was about West Virginia's 15th annual New River Birding and Nature Festival. It is archived and always available on the Center's Web site as Installment #655. 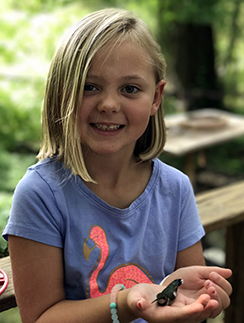 It's been a while since we've showcased our granddaughters in an installment of "This Week at Hilton Pond," but when they came to visit with their father (Billy Hilton III) he got out his new iPhone 7 Plus, flicked its internal camera into "portrait mode," and shot the two images at left of the girls helping Pap Hilton capture, band, and release some Ruby-throated Hummingbirds. We can hardly avoid sharing these photos on-line. Big sister McKinley Ballard Hilton (top photo, now six years old) has quite a bit of experience banding House Finches, having helped Pap remove them from traps on several occasions. 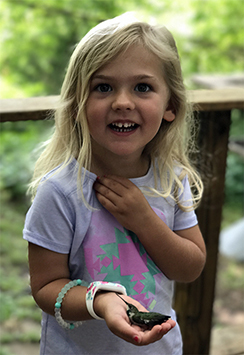 Hadley Reid Hilton (nearly four) was once a bit shy about live birds but has come of age and dived into the task at hand. She was obviously pleased about a banded hummingbird sitting in her open palm, as was Mac. We encourage all our readers who love nature to share your knowledge with young people in whatever way you can. After all, they are our future--in more ways than one.